How do I Care for My Orthodontic Expander? If you are undergoing orthodontic treatment using a palatal expander, it’s essential to take care of these appliances to maintain your optimal level of oral health throughout your orthodontic treatment plan Proper care for a non-removable oral appliance like a traditional orthodontic expander can take some extra time, but as long as you stay on top of regularly cleaning your appliance, there should be no adverse effects on your oral health. 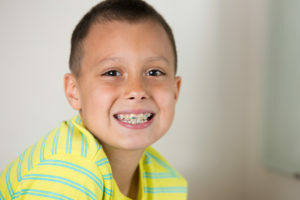 Since many patients who receive a palatal expander are very young, it’s important for parents to be aware of these at-home oral health care needs as well. In this post, we’ll discuss, in detail, how to best care for your smile while receiving treatment with an orthodontic expander. The first step to keeping your smile whole and healthy during orthodontic appliance treatment is to brush your palatal expander at least twice a day at the same time you brush your teeth. You should also take care to rinse the area around your expander following meals. For best results, many patients brush teeth and their appliance between meals or use an antimicrobial mouth rinse. There are also removable expanders available. If your palatal expander is removable, you should still clean the appliance and surrounding tissues at least twice a day. However, many patients find it easier to clean these removable appliances than it is to clean those that are fixed. In order to ensure proper care, you need to use the right oral hygiene products. We always recommend patients use a soft bristled toothbrush and minimally abrasive toothpaste. You may also want to invest in a water flosser to thoroughly remove food particles and plaque from your palatal expander. Your orthodontist may also recommend you use an antimicrobial rinse to reduce the numbers of plaque-producing oral bacteria. During your regular orthodontic checkups, we’ll examine your appliance and your smile. If we notice any issues, we can make repairs, adjust, or replace your orthodontic appliance. If your palatal expander is damaged between visits, please call us right away. You should not wear a broken or bent oral appliance as this can cause serious damage to your smile. Gary Cartwright, DMD, is a skilled and dedicated orthodontist who goes above and beyond to help patients of all ages achieve their desired smile alignment results quickly and comfortably. We offer a wide range of traditional and specialty orthodontic solutions for our patients at Cartwright orthodontics, including treatment with palatal expanders. Our McMurray orthodontist and team are here to help with all of your smile alignment solutions. Are you interested in finding out more about your orthodontic options? Contact Cartwright Orthodontics in McMurray or Bethel Park to schedule your orthodontic consultation with us today. Comments Off on How do I Care for My Orthodontic Expander?